Is Associate Professor of Theoretical Philosophy at the University of Salerno, where she also teaches Theoretical Philosophy and Philosophical Theories of Mind-Body Relation. She is author of many articles and several books, including L’infanzia della filosofia. Saggio sulla filosofia dell’educazione di Maurice Merleau-Ponty (UTET, Torino 2002), Di-spiegamenti. Soggetto, corpo e comunità in Jean-Luc Nancy (Mimesis, Milano 2006), Les détours d’une pensée vivante. Transitions et changements de paradigme dans la réflexion de Roberto Esposito (Mimesis France, Paris 2012), L’ora meridiana. Il pensiero inoperoso di Jean-Luc Nancy tra ontologia, estetica e politica (Mimesis, Milano 2012), Unlimit. Rethinking the Boundaries between Philosophy, Aesthetics and Arts, coedited with G. Bird and D. Giugliano, Preface by J.-L. Nancy (Mimesis International, Milan 2017). Is philosopher, musicologist and poet. Since 1998 she has been Full Professor at the University of Paris IV-Sorbonne; in 2008, she founded the “Collège des études juives et de philosophie contemporaine – Centre Emmanuel Levinas”. She’s Associate Professor at the Husserl Archives in Paris at Ecole Normale Supérieure. Her publications includes books on the work of Emmanuel Levinas, on the thought of Benjamin, Rosenzweig, Adorno, Derrida et Balchot, Nancy, and on music. She is director of several series by the Éditions Hermann and president of “Cahiers Maurice Blanchot”, which she co-founded with Monique Antelme and Mike Holland in 2010. Among her recent books are: Inventions à deux voix. Entretiens, co-written with J.-L. Nancy (Du Felin Eds., Paris 2015), Un percée de l’humain (Payot/Rivages poche, Paris 2015), Le divenir-juif du poème. Double envoi: Celan et Derrida (PU, Montréal 2015). Georges Didi-Huberman, storico dell’arte e filosofo, insegna presso l’École des hautes études en sciences sociales, dove occupa il titolo di maître de conférences dal 1990. Ha insegnato in numerose università europee e nordamericane (Berkeley, Johns Hopkins, Freie Universität Berlin, Université-Eikones NFS Bildkritik Basilea...). Vincitore di due premi dell’Académie des beaux-arts, il premio Hans Reimer dell’Aby- Warburg-Stiftung, il premio Napoli e il premio Humboldt. Tra i suoi libri pubblicati in italiano, ricordiamo: Immagini malgrado tutto (2005); L’immagine aperta. Motivi dell’incarnazione nelle arti visive (2008); La pittura incarnata (2008); Aprire Venere. Nudità, sogno, crudeltà (2014). Is Professor Emeritus of Moral Philosophy at the University of Naples “Federico II”, where he also taught Theoretical Philosophy and directed, from 1984 to 1990, the Department of Philosophy. Member of “Accademia Pontaniana” of Naples, of “Accademia Pugliese delle Scienze”, of “Società Nazionale di Scienze, Lettere ed Arti” of Naples. He was a member of Italian House of Representatives and of Senate. He is author of many books and essays, among which we can remember: Intuizione e discorso (Libreria Scientifica, Napoli 1955), Struttura soggetto prassi (Libreria Scientifica, Napoli 1962, n. ed. ESI, Napoli 1994), Lezioni sull’intersoggettività (Libreria Scientifica, Napoli 1964), La comunità come fondamento (Libreria Scientifica, Napoli 1965), Il senso del fondamento (Libreria Scientifica, Napoli 1967) Antimetafisica del fondamento (Guida, Napoli 1971), Metafisica (Mondadori, Milano 1980), Fichte. L’intersoggettività e l’originario (Guida, Napoli 1986), Filosofie del soggetto e diritto del senso (Marietti, Genova 1990), Il tempo e la grazia (Donzelli, Roma 1995), Paticità e indifferenza (il Melangolo, Genova 2003), La libertà e le occasioni (Jaca Book, Milano 2011), Piccolo teatro filosofico (Mursia, Milano 2012), Giordano Bruno maestro d’anarchia (Edizioni Saletta dell’Uva, Caserta 2016), L’arcisenso. Dialettica della solitudine (being published by Quodlibet, Macerata). Is researcher in Theoretical Philosophy at the University of Naples Federico II. She has obtained the teaching qualification as Professor in Theoretical Philosophy and Moral Philosophy. Her main research interest focuses on the theory of historical knowledge, especially in contemporary philosophy. She has been editor for the three-year project Lessico crociano. Un breviario filosofico-politico per il futuro (La Scuola di Pitagora, Napoli 2016). She is also co-director for the series of philosophy Vita Nova, for the editor Le Lettere, Firenze, member of the national editorial board of “Shift. 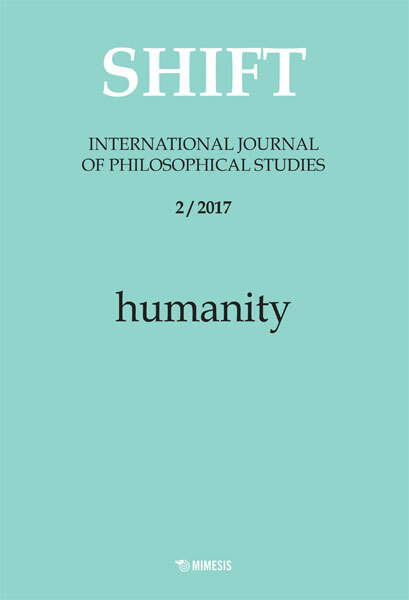 International Journal of Philosophical Studies” (Mimesis, Milano) and member of editorial board of “Shift. Philosophical Series” (Mimesis International). In October 2016, she received in Rome the “Dante Alighieri” award. Among her publications, Logica dell’altro. Heidegger e Platone (Giannini, Napoli 2008); L’identico e i molteplici. Meditazioni michelstaedteriane (Loffredo, Napoli 2011); Michelstaedter al futuro (La Scuola di Pitagora, Napoli 2012); H. Arendt, Humanitas mundi. Scritti su Karl Jaspers (ed. by R. Peluso, Mimesis, Milano 2015); 19 domande su Benedetto Croce. Idealismo e altre idee (Società Dante Alighieri, Roma 2017). Teaches History of Philosophy at the Department of Human Sciences, Philosophy and Education of the University of Salerno (since October 1st 2005 as Full Professor) and has other teaching charges in other Departments of the same University. He is also part of the teaching team in the post-graduate school of studies on Late-Ancient, Medieval and Humanist Culture (RAMUS). His published works concern mainly, but not only, European Early-Modern Philosophy. Among the topics on which he worked more intensively, one may mention: (i) Leibniz’s metaphysics, philosophy of action, principle of sufficient reason; (ii) Modern natural rights doctrines; (iii) Psychology of imagination, its evolution since Aristotle to the Modern Age and its actual interest; (iv) Critical thinking and its place in education. He is author of many articles and several books, including Manuale di educazione al pensiero critico. Comprendere e argomentare (Editoriale Scientifica, Napoli 2015); G. W. Leibniz, Dialoghi filosofici e scientifici (ed. by F. Piro, Bompiani, Milano 2007); Spontaneità e ragion sufficiente: Determinismo e filosofia dell’azione in Leibniz (Edizioni di Storia e Letteratura, Roma 2002).